... and bought the Clarisonic Mia with my 20% off Sephora discount. The jury is still out, as I've only had it for two weeks, but so far I really like it. I'll give it a month or two and will let you know if I see any major improvements in my skin. If so, why do you love it and what facial cleanser have you been using with it? I want one, but can't seem to stomach the price tag. Can't wait to see if you think it's worth it! honestly, I'm not even 100% sure of what a Clarisonic does. It's a scrub brush for your face right? for dead skin? i have the pro x. i used to use it every night but now i use it once a week. i can't figure out what cleanser to use with it...the one that comes with it STINKS. I love mine and use Philosophy Purity with it. It works great and is pretty gentle. I agree with Beth - the one it comes with is pretty awful. Um...what is a clarisonic? Is this supposed to exfoliate? I'm totally out of the loop on beauty products. I love mine!! (in pink of course) but it totally tickles my nose when I use it there, does that happen to you? I bought it too with my 20% off!! I LOOOOOOVE it.. Totally already see a difference in the size of my pores. I did too! I've been wanting one for a while and then with the 20% I bought it. So far I love it too and my face feels so soft already! Ohhh keep me posted! Iwas seriously going to buy one this week with a Nordstrom gift card I have! How do you get the 20% sephora discount? Was that with your beautify insider points? 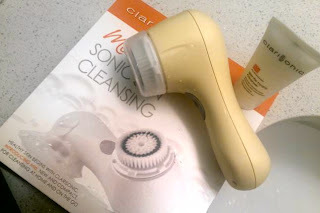 I love my Clarisonic Mia! It's almost hard to remember what face washing was like before it! Seriously, it's become second nature now but I remember when I was new to using it, I couldn't get over how much cleaner my face looked and felt! I love love love mine! Can't imagine being without. It makes me and my skin happy!